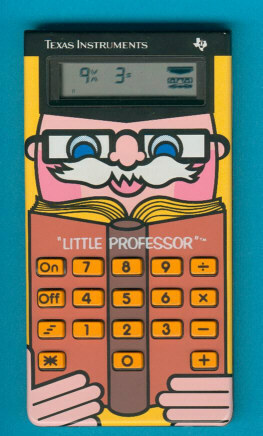 Size: 5.3" x 3.3" x 1.3"
Compared with the early Little Professor with the LED display this one uses a LCD to ask the child one of thousands pre-programmed math questions. Instead of the membrane keys introduced few years ago with the Little Professor (1982) in the United States, this one followed the Little Professor (UK) developed in Europe and uses again normal keys. The technology of the keyboard is identical to well known scientific calculator. Compare it with the TI-30. This cutie got later solar cells and stylish keys. View the Solar Little Professor. Don't miss the Galaxy 9 to get other ideas of "educational" calculators. The Little Professor is featured in the Texas Instruments France SA leaflet Magiques et Intelligents dated 1991 and the Texas Instruments Deutschland GmbH leaflet Spielen macht schlau dated 1991.